You can find cultured pearl and aquamarine cluster earrings 'Cool Beauty' by Nareerat in jewelry categories such as Birthstone Earrings, Aquamarine Earrings, Calcite Earrings, Pearl Earrings, PEARL Cultured Earrings, Quartz Earrings, Multigem Earrings, Silver Earrings, Sterling Silver Earrings, Silver Plated Earrings, Cluster Earrings, Beaded Earrings and Dangle Earrings. Enjoy exploring these sections for other Novica treasures. "A gift for my daughter in law"
My daughter in law just received this today. I got her the matching necklace too. She called to say they are gorgeous. Thank you again Novica for always have the nicest things. 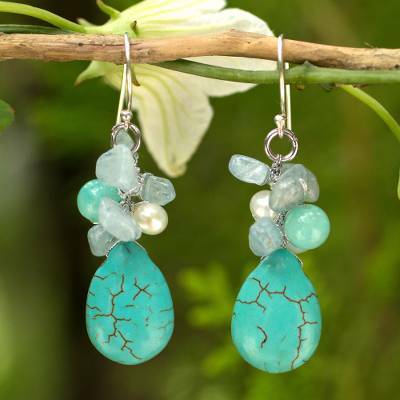 "Beautiful mix of Turquoise and pearls"
Beautiful. My sister will love them.